Driving across all of India would be a challenging adventure in any vehicle, but as our friends at Car and Driver found out, being tasked with doing it in a Ferrari is a completely different proposition. 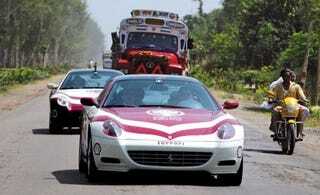 They were among the few selected to drive a pair of Ferrari 612 Scagliettis around the sub-continent for a 524-mile stretch of the 7000-mile Magic India Discovery Tour. Since the adventure, the car has been auctioned off for charity, but as you can tell from the excerpt below, the memories of the journey will likely stay with them forever. Ferrari modified the 612s for India by raising the ride height 1.2 inches and replacing the composite undertray with an aluminum sheet. However, it had no time to fit these two particular cars with the new F1 transmission before shipping out to India. And for some unfathomable reason, the cars are left-hand-drive, contrary to India's British-inherited rules. Passing is a two-man operation, the navigator's script usually as follows: "No . . . no . . . no. Okay, go. WAIT!!"